Maria Miralles, R.N., provides a little TLC to patient Dixie Doss of Fairfield. Maria Miralles, R.N., cut her teeth in a busy Detroit hospital, where her colleagues would see a dozen or more gunshot wounds a day. That was on top of all the other trauma and emergency cases that would blow through the doors, easily filling up their 120 emergency department beds. 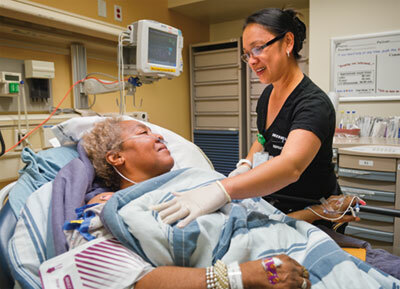 It was a far cry from her start in the business as a dialysis nurse. But somewhere along the line, someone saw potential in her ability to corral chaos and redirect the energy into an efficient, streamlined process. And it’s those skills that make her so valuable in NorthBay Medical Center’s Emergency Department, say her colleagues, especially as a trauma program is being crafted. That may be because Henry Ford Hospital in Detroit, where she learned her skills, was a Level I teaching facility. she’s still juggling the needs of several patients, and directing traffic as it pulses around the busy nurses’ station. Miralles puts an arm around Dr. Mark Popil’s shoulders and asks if he will promise to have a quiet night so that when she returns at 6 a.m., it won’t be too frenzied. Although NorthBay’s Emergency Department facilities are much smaller than Detroit (a combined 36 beds), there are still plenty of challenges, she notes. In addition to a steady steam of traffic and a wide variety of cases that you’d find in any ED, she’s excited about the new programs NorthBay is adding.